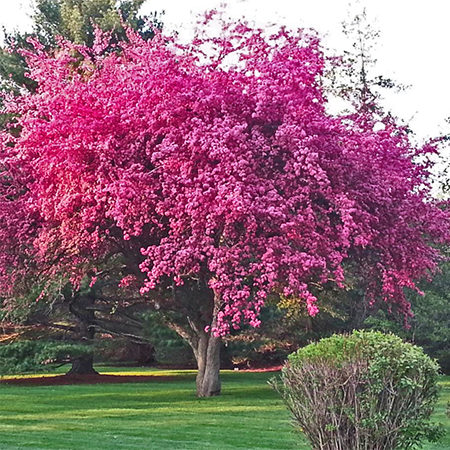 Beautiful, ornamental, inexpensive and long lived, the Kwanzan Cherry Tree (a.k.a. Japanese Cherry, Hill Cherry, Oriental Cherry or East Asian Cherry) is a species of cherry native to Japan, Korea and China. It is known for its spring cherry blossom displays and festivals. Behind the Yoshino Cherry trees, the Kwanzan trees are the second most planted/celebrated trees planted on the Tidal Basin in Washington, DC and celebrated annually during the National Cherry Blossom Festival held in the Nation's Capital. With a dense top ("crown") they can achieve a height of 26-39 feet and can live to be over 100 years old. Tree will arrive from a tree farm in West Virgina and will be 2-3 feet in height.